Callaway Golf says its new Big Bertha OS Irons incorporate a club head construction called “Exo-Cage’’ that promotes more distance in “an entirely new way.’’ The company says the Exo-Cage’s combination of strength and light weight allows Callaway engineers to distribute more discretionary weight into strategic locations to promote more forgiveness, and allows the next-generation 360 Face Cup technology to function more efficiently. The result, according to Callaway, is more ball speed across the face to give you more distance on every swing. In addition, Big Bertha OS Hybrids feature a deeper body, larger and faster face, and a next-generation Hyper Speed Face Cup. 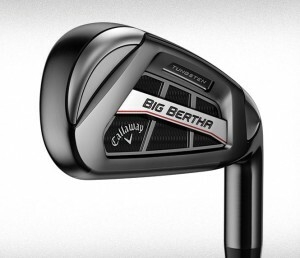 The Big Bertha OS Irons and Hybrids will be available Sept. 30. The OS irons will carry a suggested retail price of $1,099 for a steel set, and $1,299 for a graphite set. The Big Bertha OS Hybrids will be available at a SRP of $249 each.